Originally I had planned to spend Saturday watching two baseball games, one in Montgomery at 2 p.m. and one in Birmingham at 6:30. With the two cities about 100 miles apart, it would have been a tight squeeze to get both in. 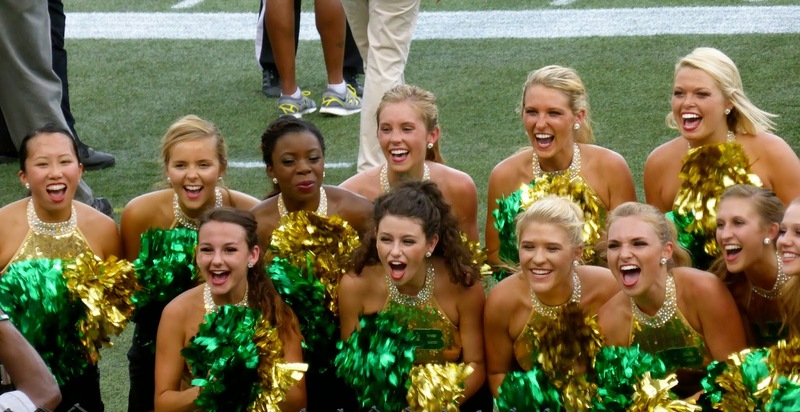 Then my friend Meg mentioned that the University of Alabama at Birmingham would open their 2014 season on Saturday morning at 11 am. This was a much better alternative as I would see another venue as well as make the 90-minute drive in the morning, thus ensuring I would get to the ballgame without worry. So I left my Montgomery hotel just before 9 and headed up I-65, arriving at Legion Field in plenty of time for kickoff. 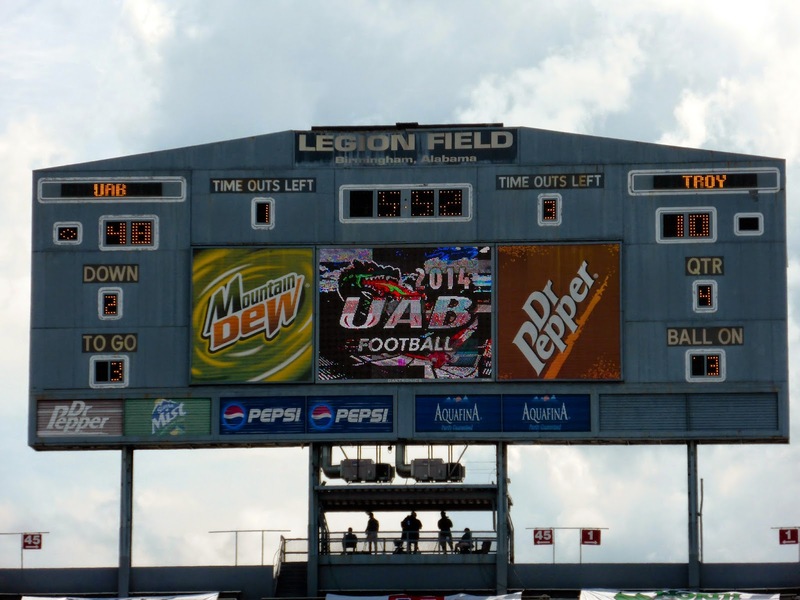 Opened in 1927, Legion Field was once the greatest football venue in the South. It hosted the Iron Bowl from 1948-88, and both Alabama and Auburn played many other games here over the years, but as the facility deteriorated and their on-campus stadiums improved, they both stopped using it as an alternative. 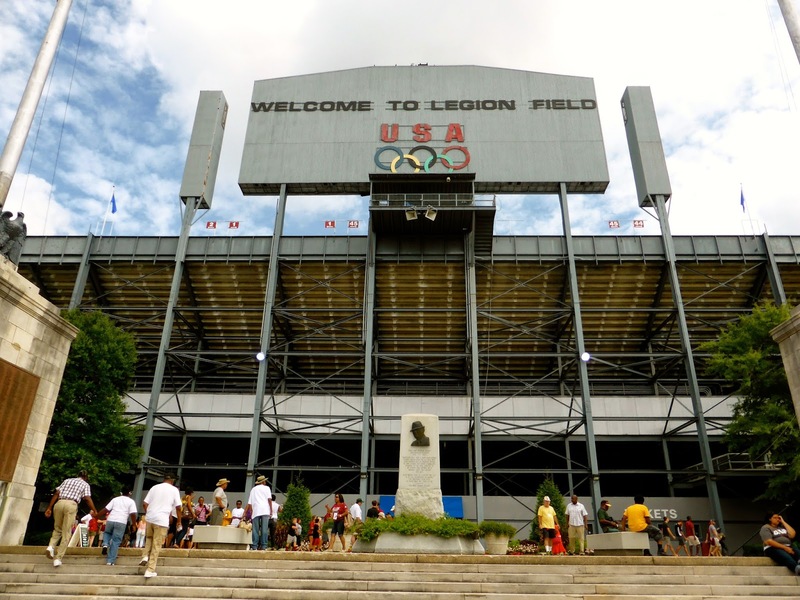 Even the US Men's National Team played at Legion Field, and the highest ever attendance was for an Olympic qualifying match against Argentina in 1996, witnessed by 83,183 fans. That record can never be beaten because since then, the upper deck of the stadium was condemned and subsequently demolished, so that capacity is now just 71,594, and probably less than that with tarps over the end zone seats. 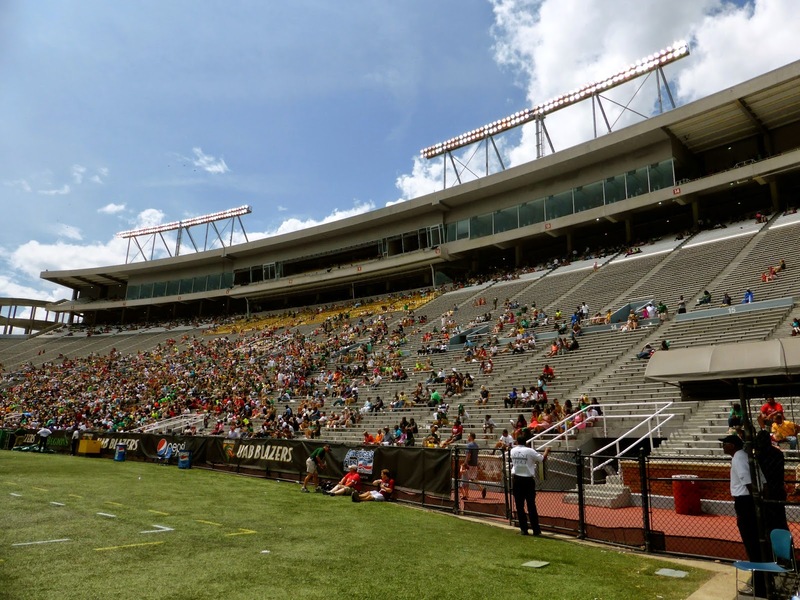 These days, the stadium is used only by the UAB Blazers, who draw less than 30,000, which makes parking a lot easier at least. 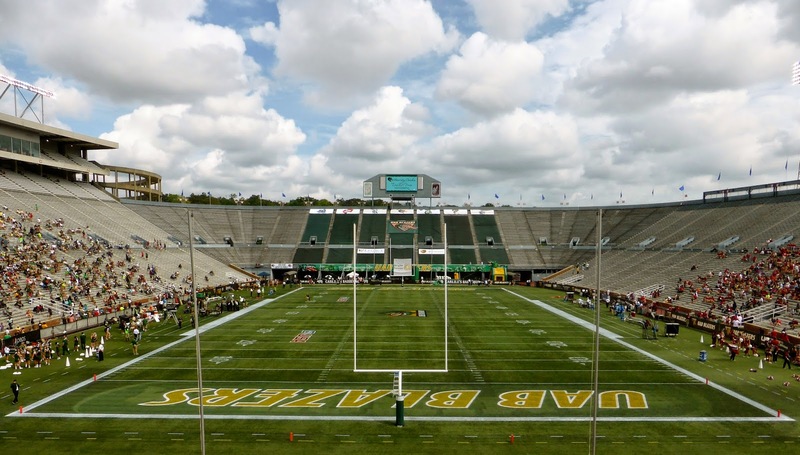 Tickets are only $15, which makes this one of the cheapest FBS destinations. But the stadium is clearly nearing its end of life and is no longer entirely maintained, making it is both fascinating and depressing to watch a game here. It is huge but has few box seats, and the thousands of metal bleachers reflect the relentless sun to make sitting there on a hot afternoon a trying experience. Smart fans move right to the top on the UAB side, where several rows are in the shade, as you can see above. There are some old-style concessions which are reasonably priced, with the recommended spot the BBQ stand in one end zone, from where you can stand and get some good views of the action at field level. Beyond that though, it is tough to spend the entire 4 hours here for a college football game. I walked around quite a bit, but there is little to see. The scoreboards are ancient and so there is nothing to do during the interminable TV timeouts. I rarely advise that you avoid a stadium, but this is one that a stadium traveller need not add to the bucket list. See a game in Auburn or Tuscaloosa instead. 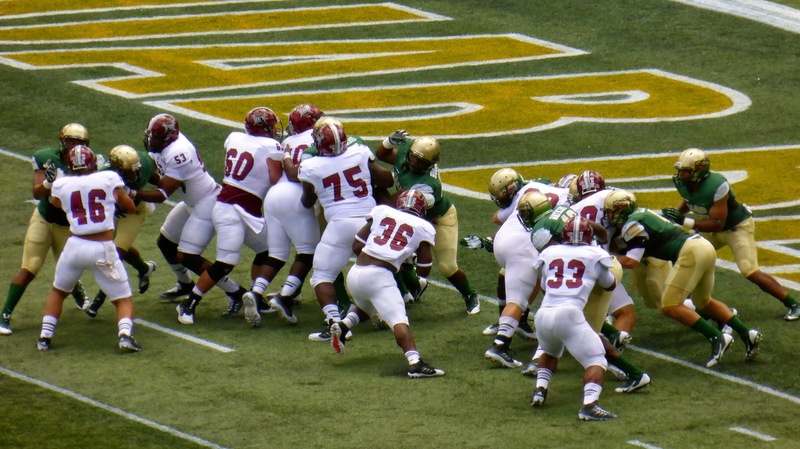 Troy is based in Montgomery and the two teams are apparently fierce interstate rivals. Not quite like Alabama and Auburn, but still enough to have fans sitting on separate sides of the stadium. 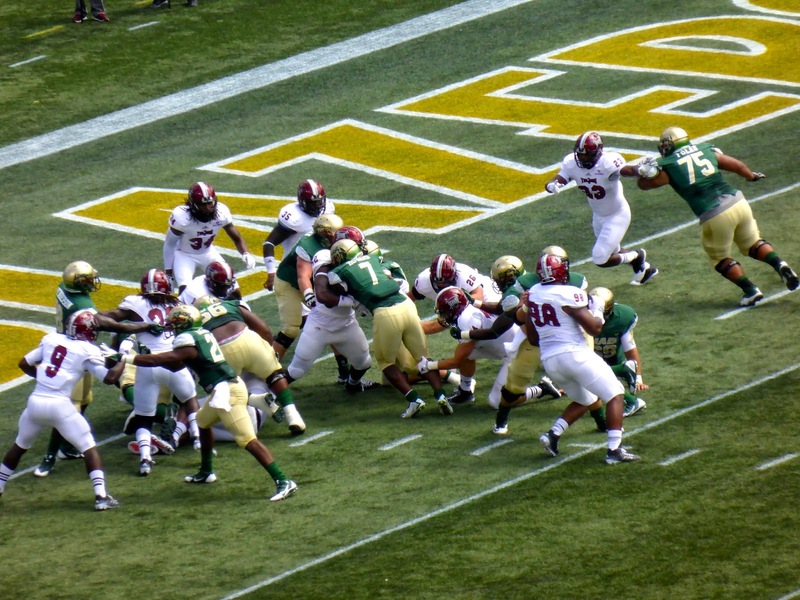 Troy came in as 2.5-point favourites and scored on a one-yard run by Jordan Chunn (#36 below) on their first drive, but that was about it. 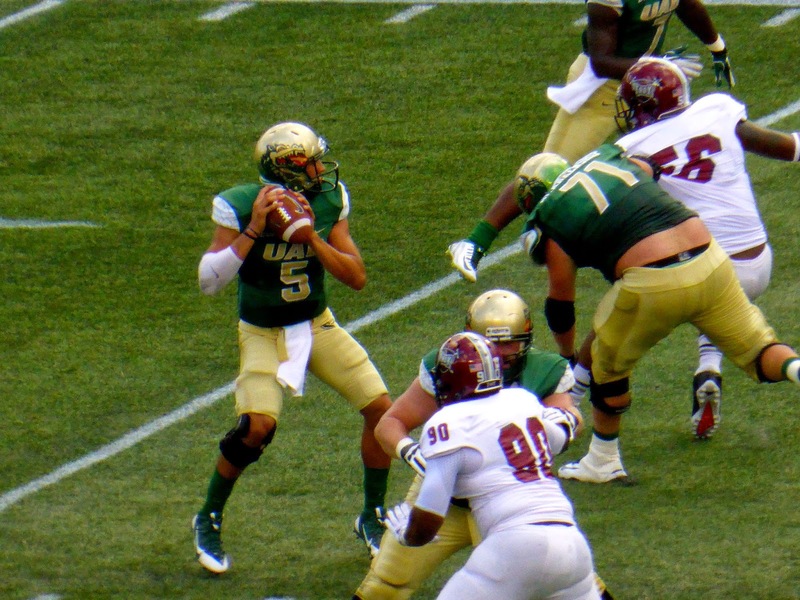 UAB scored on their first drive behind QB Cody Clements (#5), a JC transfer from Cerritos College, who finished 13/19 for 152 yards, with 2 passing TDs and another on the ground. 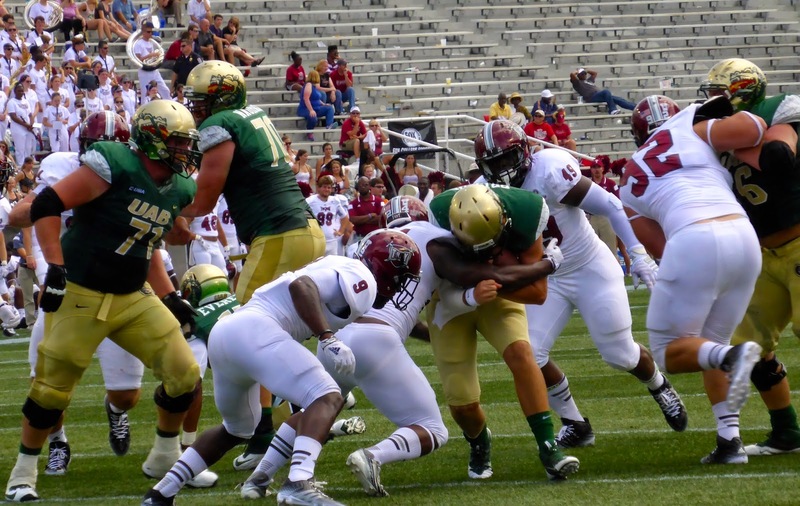 After Troy fumbled on their next possession, UAB spent the rest of the afternoon running rampant over the Trojans, scoring on 8 of 12 possessions (6 touchdowns) to win easily 48-10. The star was Jordan Howard (#7 below) who ran for 179 yards and 2 touchdowns, including a 55-yarder that made the score 31-10 and essentially ended the game. 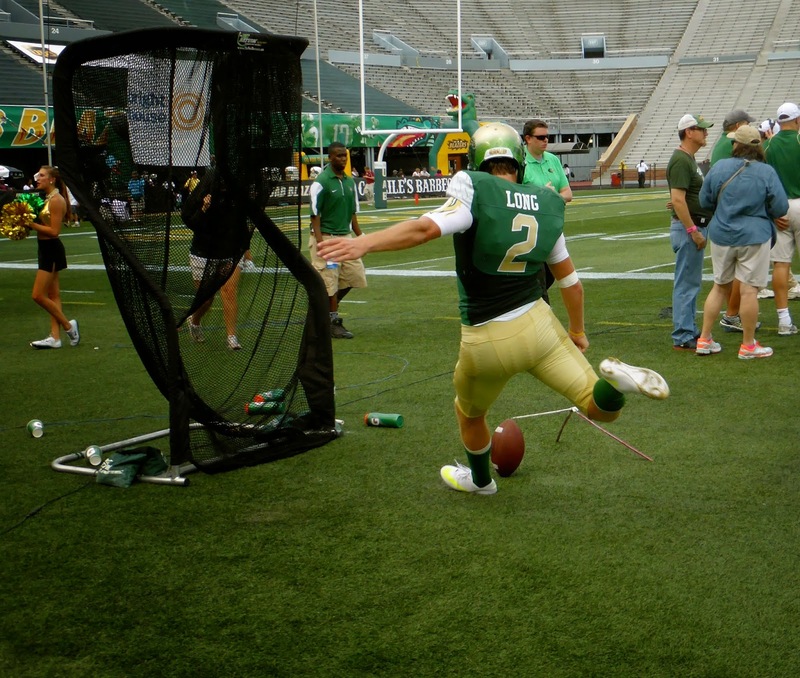 The other player to note is Blazer kicker Ty Long, whose kickoffs routinely went into the end zone, and who made both his field goals. He is the mostly likely player from both teams to make the NFL next season. That's the final score with 5:52 to go. I left at this time as I had seen more than enough of this blowout. The game took about 3½ hours, a function of the different pace of college football where teams run plays with 20 seconds left on the play clock, plus the incredible length and number of TV timeouts. After two hours, only five minutes had passed in the third quarter. I understand the need to extend the big games to nearly four hours to maximize advertising revenue, but to have this game prolonged seemed just mean. Especially to those poor Troy fans who had no shade on their side of the stadium (above). The best thing about college sports is the enthusiasm of the students that are members of the band and cheerleading teams. Especially the cheerleading teams.